South of Jelling Church, between the two enormous mounds, stand two rune stones. One was raised by King Gorm in memory of his wife, Queen Thyra. The other was raised around 965 AD by his son Harald Bluetooth, in memory of his parents and his own achievements in particular. Harald Bluetooth’s rune stone has been called "Denmark's certificate of baptism". With its commemorative script the Danish king officially confirmed the new Christian faith. The two rune stones at Jelling. Photo: Anne Pedersen. 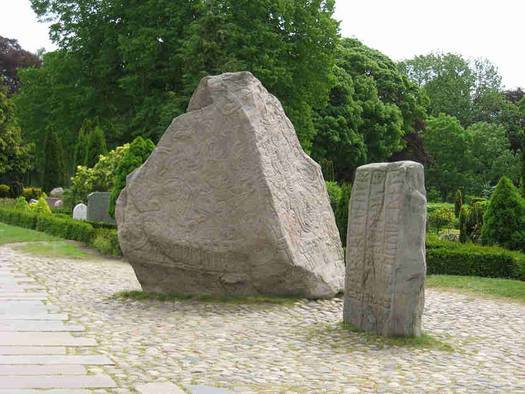 In March 2008 a report was published on the condition of the Jelling Stones. Here you can read about how the famous stones have fared through time. Amongst other treatment, they have been scrubbed, scraped free of moss, washed with salt solution, sealed with stone putty and had shellac poured over them.